Submitted by mahoney on Thu, 05/31/2007 - 12:37pm. 562 Steak 'n Shake restaurants, From their website, current as of 7/25/2016. 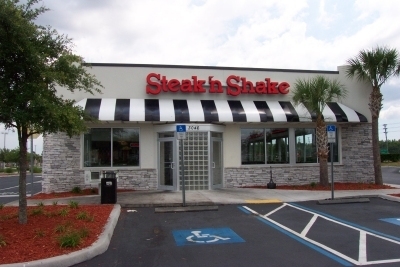 Note: The location in New York which opened on 1/12/2012 is the first ever Steak 'n Shake Signature concept restaurant. Since that date, other Signature concept restaurants have opened on Canton,MO and Paramus,NJ. Aided in correcting the coord for the location at 14909 US 31 North, Carmel,IN 46032. Added new locations in Russellville,Ar,Burbank,Ca,Fogelsville,Pa,Bristol,Tn,Tyler,Tx and Seattle,Wa. Submitted corrected coord for the location at 3232 Bardstown Rd, Louisville,KY. Added new locations in Russellville,AR and Centerville,UT. Added new locations in Raleigh,NC and Myrtle Beach,SC. Added new locations in Union City,GA and Bowling Green,KY. Deleted location in Southlake,Tx. Submitted corrected coordinates for the location at 9560 Regency Square Blvd N, Jacksonville,FL 32225. Added a new location in Virginia Beach,VA. Added new locations in Santa Monica,CA, Greeley,CO and Vincennes,IN. The location in Tyler,TX is now open. Location in Paris,TN is now open. Also added new locations in Hampton,VA, Victorville,CA, Sedalia,MO, Sevierville,TN. Added new locations in Birmingham,AL, Pooler,GA, Biloxi,MS and coming soon location in Paris,TN. Added new locations in Somerset,KY and Lubbock,TX. Added new locations in Hoover,AL, Batesville,IN and San Antonio,TX. Added 5 new locations. Opelika,AL, Tempe,AZ, Douglasville,GA, Madison,GA and Billings,MT. Location in San Antonio,Tx is now open. Also added new location in Reno,Nv. Added 9 new locations including a opening soon location in San Antonio,TX. Updated the file using the latest data from the website. Added a new location in Alabaster,AL. Added 5 new locations. Augusta,GA, Canton,MO (signature), Poplar Bluff,MO, Winston Salem,NC and Webster,TX (opening soon). Location in Pearland,Tx is now open. Added 1st location in Louisians (Covington). Verified the locations to the website locator. Submitted corrected coordinates for the Mansfield,OH location.